If a job’s worth doing, it’s worth doing properly: so when preparing for this, the first of two reviews from Tom Lloyd’s Twilight Reign saga, I went out and bought the whole bally lot of them. 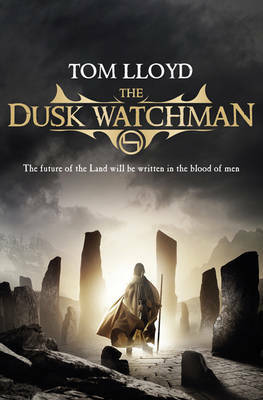 Given that Dusk Watchman is the fifth and final instalment of the main story, this proved to be a wise decision, for had I not invested the time in reading this fantasy series from the very beginning, I doubt I would have enjoyed this book half as much as I did. Set in a landscape of disparate nations, Twilight Reign weaves together the stories of several lead characters whose destinies overlap in a world forced to redefine the way it interacts with its Gods. First and foremost of these is Isak Stormcaller, the white-eye son of a wagon trader, chosen by Lord Bahl of the Farlan to become his heir-elect. When Bahl is lured to his death, Isak prematurely becomes Lord of the Farlan and is forced into war with the invading Menin, led by the peerless warrior Lord Styrax. Haunted by dreams of his own demise, Isak secures an alliance with the neighbouring King Emin, and is forced to sacrifice himself on the battlefield, succeeding in killing the son of his enemy before he is cast down into the pits of the underworld, Ghenna. Unknown to all but King Emin, an ancient shadow is manipulating the course of the war, turning events in its favour as it seeks to undermine the power of the Gods by turning the people from worship. As Lord Styrax and his army marches relentlessly into Narkang, King Emin and his followers fight a retreating battle, simultaneously seeking to discover the truth of the shadow’s plan and stop the annihilation of their own kingdom at the hands of the Menin. Meanwhile, Mihn, the disgraced Harlequin and loyal servant of Isak, ventures into Ghenna, to steal back his former Lord from the clutches of demons. With his previous fate now fulfilled, Isak is able to rebuild his memories and turn the tide of battle in their favour by cursing Lord Styrax. It is at this point, at the very end of the battle for Narkang, that we rejoin the action in Dusk Watchman, with King Emin finally discovering the Shadow’s true plan. With the Menin still in search of revenge, Isak and his friends journey north into Vanach, to retrieve an ancient weapon from the hands of the vampiric Vukotic clan, which may be their only chance for victory. As the Shadow and his supporters finally brings the Gods to their knees, Emin and Isak wage one last terrible battle to avert an age of darkness engulfing the land. Twilight Reign is about as action-packed a fantasy series as you could wish for, and with its numerous sprawling battle sequences, dragons and monsters, those with a thirst for bloodshed will not be disappointed. What makes this series worthy of attention though is the depth of scale applied by Lloyd to his universe as a whole, with even the more minor characters being given complete arcs, which interweave well with the overall epic. By the end I had several favourite characters and was excited to see who would survive in the end. Something and someone for everyone, and definitely well worth your time.